My experience is that the adhesive on vinyl sheets used in vinyl cutters for outdoor signage does not have this problem. If you use other types of vinyl that have adhesives like contact paper, electrical tape, packing tape, etc., the water will attack the adhesive. The more typical way of masking the piece is with toner transfer. 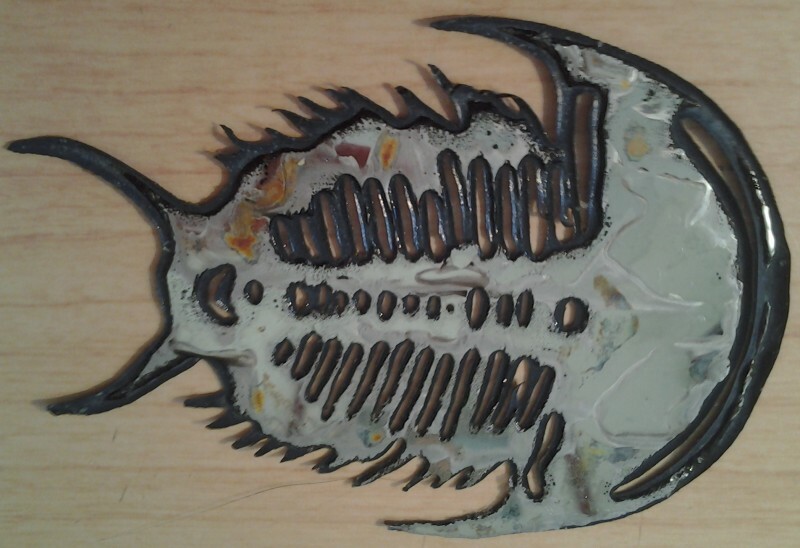 Probably the cheapest way to do this is with wax covering the surface and scratching your design into it to expose the metal to be etched away. There are a whole lot of recipes for masking coatings based around pitch, tar, beeswax and shellac. I found heating the metal to be etched and coating it with beeswax, then cooling and using a ballpoint pen (tungsten ball) as a stylus worked well. The fine lines that the ballpoint gave in beeswax were undercut and widened up slightly. Coat backing with electrical tape. Attach pos electrode to the etch piece. Attach neg electrode to sacrificial metal. Battery charger, 14.5v, 5-10A, 8 hr. The type of steel you are trying to etch will affect results enormously, carbon steel is the worst as you have to have a small soft brush to keep brushing the exposed carbon off the steel as it doesn’t etch too well. Alloy steels like stainless with low carbon and fine grain structure give excellent detail when etched. Back coated with two layer plastic backing that the steel sheet came with. The front was sprayed with Minwax Fast-Drying Polyurethane clear semi-gloss, 4-5 thin coats, and dried overnight. 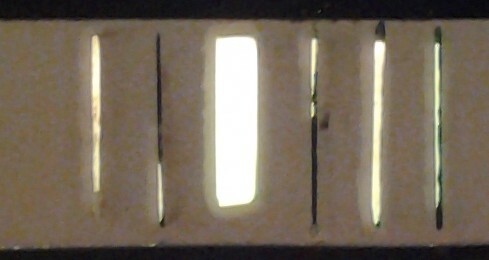 Three 10cm x 4cm rectangles were scored with a knife. Placed in water with NaCl. 20-25cm separation between the plate a steel bar, 5mmx5mmx20cm. 12V. Etched 12-16 hrs. The rectangles were nearly etched through, but there was a lot of etch through 3-4m around the scored lines, and in other places on the plate. 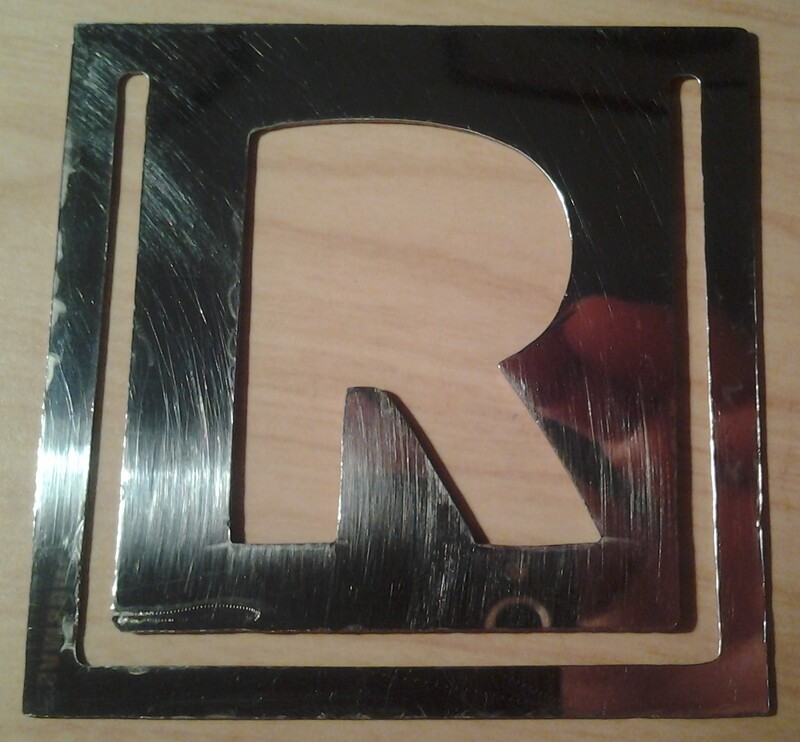 A 100x1mm line to cut off a rectangle was etched. The back is covered with a two layer plastic backing. The front is covered with shelf liner (Kittrich Co.). Placed in water with NaCl with a splash of apple vinegar. 40-55mm separation between the two plates. 12V, 1.7A – 1.6A. Progress was checked at 30 minutes, and the piece was cut off. The edge has three rough spots–perhaps where it wasn’t entirely etched through. The rest of the edge is smooth, perhaps due to electropolishing. The edge facing the negative electrode has minor undercutting, while the back surface is completely clean. The front and back are covered with shelf liner (Kittrich Co.). Electrical tape wraps the edges. I cut grooves, two just knife cuts, four 0.5-0.75mm wide, one 4mm wide and all 1.5cm across. Placed in water with NaCl with a splash of vinegar. 40-55mm separation between the two plates. 12V, 2.4-2.5A. Amps declined to 1.9A at the end, likely due to most of the exposed surface being etched through. Progress was checked at 30 minutes, and the slits were etched through. The large slit was 5.5mm wide, the four half mm ones were 1.5 – 2.0 mm wide, and the knife cuts were paper thin but not etched through. The knife cuts were etching 0.5 – 1.0 mm pits. This should be repeated with less time. 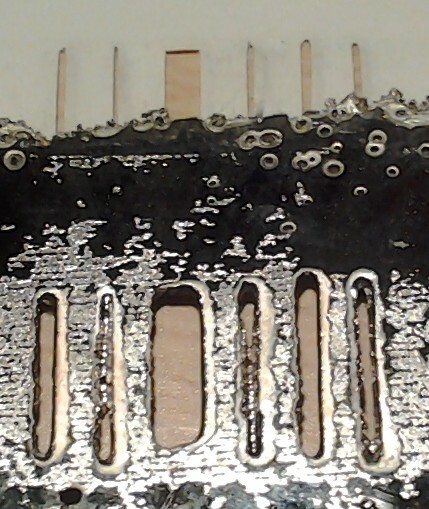 Note: the flat gray area around the slits is etching under the resist. The mottled areas are adhedsive. There was no etch through the shelf liner. I cut grooves, one 2.25 mm, one 0.75 mm, one 0.5 mm, three 0.1 – 0.25 mm. Visible etching, maybe half way, no areas etched thru. Visible etching, large area etched thru, the next two smaller areas as well. The three narrowest areas have not etched thru. The three largest areas are completely etched, the three smaller ones partially. The mask shett has come up about a mm around the edge. The sheet was hung vertically, and the upward edge (left) has more and rougher over etching. 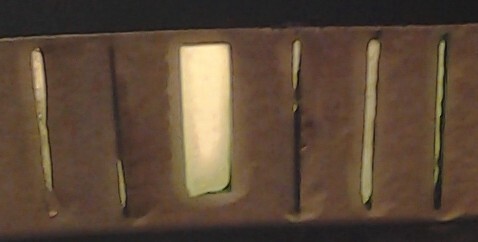 Even if the open slit is narrower, the minimum etch width is about 1 mm. Etch in small container, distance about 5cm. NaCL, vinegar. Water got in to the positive electrode. Changed the setup to side to side. 2nd try, same salt and vinegar, Side to side setup, bottom slanted towards the negative plate, about a 5 cm separation. 6A at the start, 6.3A @ 5 min, 7.3A @ 20 min, stopped at 40 min. Good results this time, very little undercutting. After etching, clean it up with a file and dremel grinder, then buff with a buff pad on a drill using the black abrasive. Masked with the GreenStar Intermediate Calendered Vinyl, 3mil (GSSIC125), Color: -GS070 Black. Small chamber, 5 cm between electrodes. 7.5A initially, 8.6A @ 5 min, 9.5A @ 10 min, 10.2A @ 20 min (dilute the water) 8.0A, 8.9A @ 40 min, 9.3A @ 60 min stopped. Over etched! Especially on the bottom side. The border gap in the mask had one narrow section of 1 cm that took longer to etch. 20 min might have been sufficient.